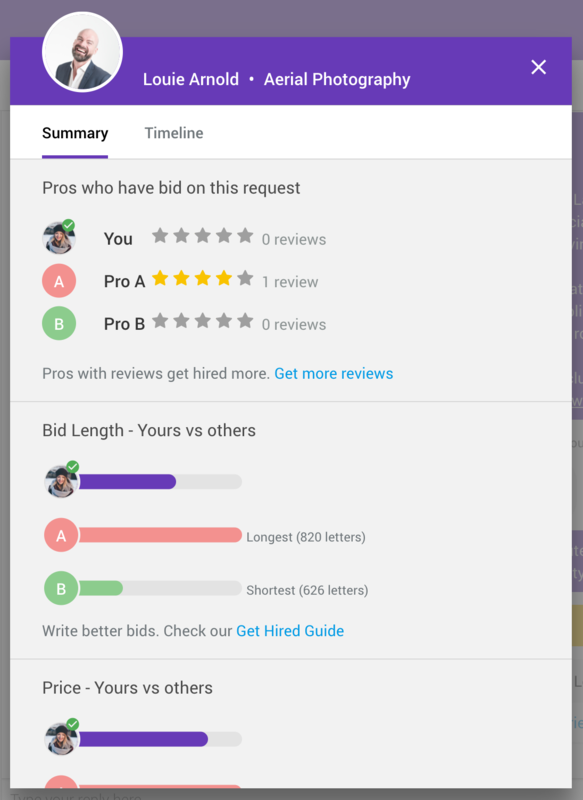 Compare your bid with other pros and learn more about your customers on Bidvine. Want to know how you stack up against your peers on Bidvine? Wondering why a potential customer chooses to work with another pro? 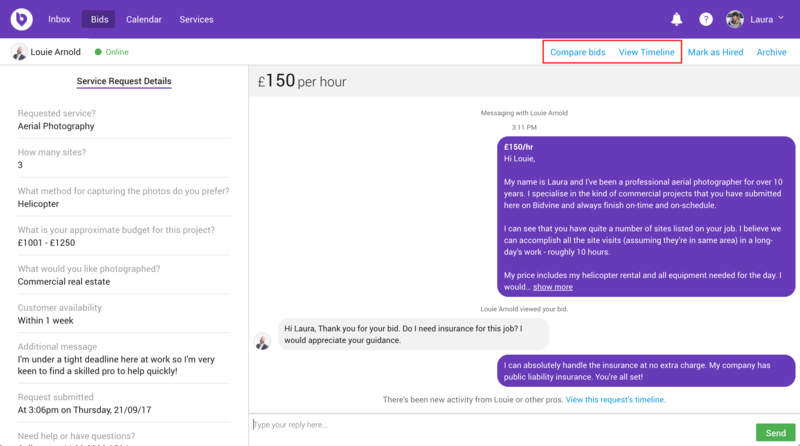 We provide Bid Insights - a tool to help you compare your bids to other professionals and see what actions a customer has taken with their request. Access these tools by clicking “Compare bids” or “View Timeline” from any bid you send. The icons you see on this page represent the other pros who have also sent bids to the same customer. You’ll typically see 2-3 other pros here. Why are the pros always named “Pro A”, “Pro B”, etc? We hide the names of other pros to protect their identity. However, all review, bid, price and rating data shown on the page is accurate. Bid Length: How long your bid was (in letters). Usually customers seek out bids with more detail before making a decision. Price: What price you included with your bid. We don’t show exact prices as we want to encourage pros to not solely compete on price. Also, we don’t show comparisons when other pros bid using a different price type (hourly rate, total cost, need more information) than you did. Time to Bid: The time between when you received the new lead notification until the time you bid. Don’t see these insights? We don’t show the summary view until after the request is closed for bids, or after the customer has hired a pro (whichever comes first). We do this to give every pro a chance to bid before we draw comparisons. 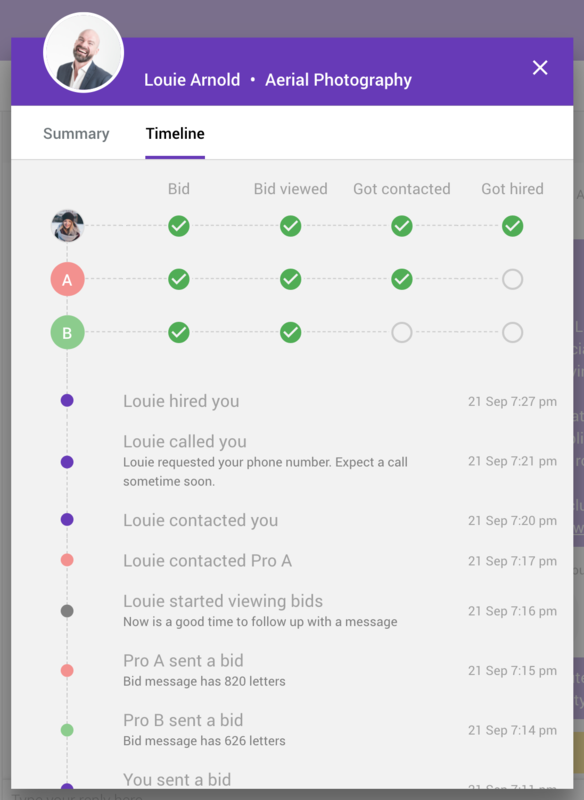 Timeline allows you to view exactly what activities your potential customer performed on Bidvine after submitting their request. Understand the right time to follow-up with the them or use the events to know who the customer contacted and hired. A phone image (📱) is displayed whenever the customer is performing an action from their mobile device. When the request was submitted by the customer. When a pro, including you, sends a bid. This message indicates the length of the bid. When a pro reveals the customer’s phone. This is a strong indicator that someone will call the customer. When the customer declines any pro, along with their reason. When the customer starts viewing bids. This is first time a customer comes back to Bidvine after submitting their request. When the customer views a pro’s phone number. Expect the customer to call this pro. When a pro is hired by the customer. When the customer contacts a pro. This occurs when the customer sends a pro a message using Bidvine. Have an idea for an insight that you’d like to know? Use the chat tool to let us know or contact us at support@bidvine.com. We’re always eager to hear your feedback and make Bidvine better for you!